Harry Styles' New Gucci Campaign! 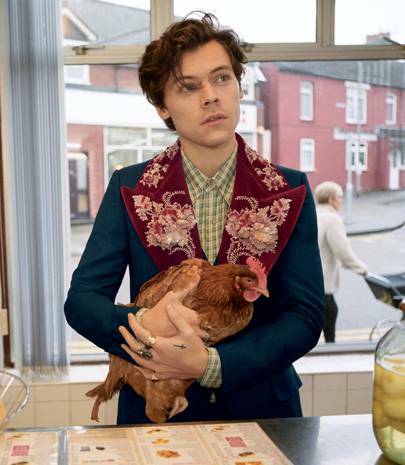 The singer has melted hearts as he poses with farm animals as face of Gucci! Harry Styles' new Gucci Campaign pictures are adorable! Harry has taken part in his second Gucci campaign with this being the men's Cruise 2019 Tailoring. In the first campaign we saw him being photographed in a chip shop with some animals in North London, including a chicken. Now he takes it outdoors! Arguably cuter than the first campaign, The photos were taken in north of Rome in the historic Villa Lante. The photo shoot contains playful shots of Styles with various farm animals as he shows off the new Cruise 2019 tailoring collection. The photos show an Italian heritage style, where Harry also rocks a headband in some shots that, it becomes quite fitting as it matches the coloured jacquard's, patches and checkered prints. we are used to seeing him wearing the head scarfs that resemble Keith Richards! What do you think? Aren't they just the most attractive campaign pictures ever? !